First introduce in App Store. 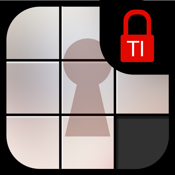 Secret Tile Game Icon is a new lock type to protect your secrets. Anyone can play this game like normal tile game. But the only one who know how to enter to secret folder is you. Secret Tile Game Icon is here to help you to protect photos, videos, notes, passwords, to-dos, audios, secret messages, locations in a very safe place behind strong security system. Plus! build-in private browser. » Brand new tile game lock type and only one in App Store. » Discreet and Camouflage tile game icon & lock type. » Utilities folder, All your secrets can be protected in one app. » Tile Game Lock Type, Passcode 4 Digits, Password Alphanumeric, Pattern Gesture, Calculator Lock. » Self-destruction, 5 chances to correct passcode. » Panic warp system, instantly switches to another app using motion gesture. 2. Self-Destruction and wipe all data will remove only the media file within the app itself. 3. To delete photos from the native Photos app or camera roll, You must delete them yourself, after importing them into the app. 4. Access the VIDEO folder used in the native iPod Application such as iPod cannot be transfer in to the app. 7. All your action with contact such as call, SMS, Email, and FaceTime, will stay in original call-log. Make sure that you delete it by your self.